Adopting a retired racing greyhound is a big decision and a commitment we take seriously. We require adopters to follow guidelines which are outlined in the adoption contract you will be required to read and sign. These guidelines are designed to keep your greyhound safe. Failing to follow them could lead to repossession of your dog. -	At all times, your greyhound must wear a buckle collar bearing his star-shaped GPA/N tag and a tag with your contact information. If rattling tags are bothersome, tape or rubber band them together or purchase a tag bag from our on-line store. -	When on leash, your greyhound must wear a martingale-style collar. 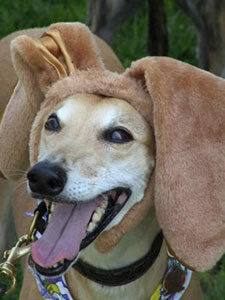 Sighthounds’ necks are often bigger than their heads so a buckle collar attached to a leash can easily slip off. -	Your greyhound is an indoor pet. Greyhounds have only 15 percent body fat, so don’t tolerate extremes in heat and cold. And because they’ve lived their whole lives in the company of other dogs and people, isolation is stressful for them. -	Never tie your greyhound outside or attach it to a run line. As sighthounds, greyhounds can see small prey up to a mile away. Because they can reach speeds of 45 mph in three strides, a greyhound could break its neck if it hits the end of a run line or stationary tether. -	In-ground electrical fencing does not work with greyhounds. Even when wearing a shock device, their speed will carry them through such fencing. -	The greyhound must be kept as a personal or family pet and be provided humane treatment and proper care, walked regularly and fed quality food. 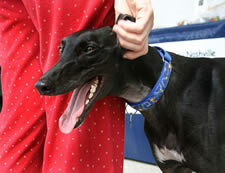 -	The greyhound will not be used for research or be given or sold to a laboratory. 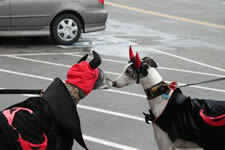 -	The greyhound's annual vaccinations must be kept current and heartworm preventative given monthly. Vaccinations requirements vary by county, so check with your vet. A dog that contracts heartworms must undergo expensive, lengthy stressful treatment and can die as a result of treatment. -	The greyhound will not be raced or used for hunting. (Would you want to work hard after you retire?) Many dogs retire from racing due to injuries. These may not be obvious unless the hound is stressed. If you will be lure coursing your hound, note this on your application so a dog believed to be healthy enough for this activity can be placed with you. -	Notify GPA immediately if your greyhound is lost or stolen. Do a quick 10-minute search through your neighborhood. Then call (615) 269-4088. That’s our emergency line. We will notify volunteers who will help search for your dog. -	Never transport your greyhound in the open back of a truck. 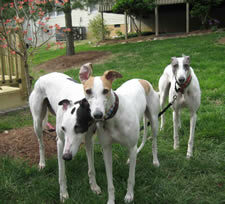 -	Leash walk your greyhound regularly if an appropriate fenced area isn’t available. Leash walking is good exercise for you and your hound and is an excellent bonding activity. It’s also the only way to ensure good housebreaking habits. -	Never use a retractable lead. Greyhounds can reach speeds of up to 45 mph, which would jerk the plastic mechanism from your hand. Then, as the dog runs, the mechanism would bounce and drag, “chasing” him. A nylon leash looped over your hand in a slipknot provides maximum control. -	If you can’t keep your greyhound for any reason, it must be returned to GPAN. We revert to sole ownership of the dog and are fully responsible for rehoming it. If you need to return your hound, call (615) 269-4088 and leave your name, phone number and your hound’s complete racing name or tattoos.